Welcome to GM Gauge Repair! At GM Gauge Repair we repair clusters others cannot- other shops may suggest having your vehicles wiring checked by a mechanic if your GM gauges or instrument cluster loses total power. Please do not waste your time and money doing this! It is not in the vehicle wiring! We can repair most clusters with total power loss. If your instrument cluster has several stickers on the back cover like the ones pictured below, chances are we can repair it. 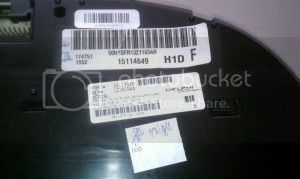 Numerous stickers on the back indicate several repair attempts. We can repair what others cannot. We get clusters like this daily! Our service is completed the same day it is received and always mailed back to you the same day. All orders are shipped via FedEx Ground and tracking information is emailed once the order has been shipped. Want to add Transmission Temperature Gauge to your existing cluster? We can add a transmission temperature gauge to many GM or GMC truck clusters. 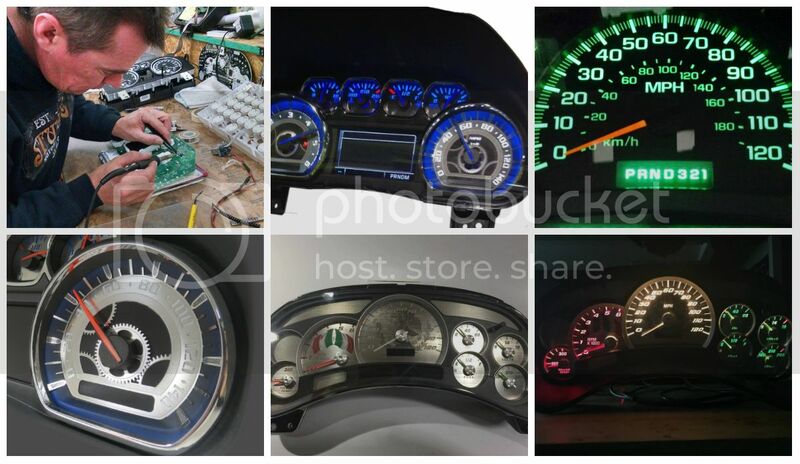 If your odometer and gear display is dim or dark, we can repair just the odometer and gear assembly for many GM and Ford vehicles back to model year 1997. Call us today and see if we can help you get your gauges working again. Also visit our Ebay store.